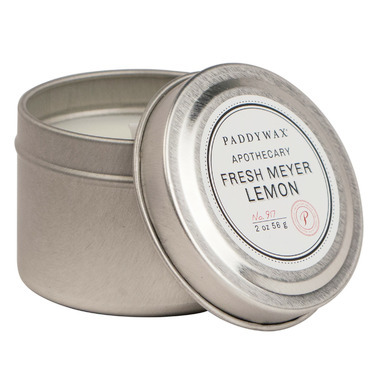 Paddywax Blue Apothecary Fresh Meyer Lemon Candle is a combination of Paddywax signature Soy Wax, paired with the perfect remedy of Fresh Meyer Lemon fragrance notes. Hand-poured in a 2 oz. silver tin inspired by the quintessential pillbox, this candle is ideal for any small space or take it with you on any journey. I love being able to buy these travel-size candles to test out scents to make sure I like them before committing to a full size. This one is a refreshing, gentle, almost creamy lemon scent, and not overpowering. This candle is tiny, and the lemon scent is unpleasant- it smells like a strong cleaning product, not like fresh fruit. I bought this and the J.R Watkins lemon cream candle which is 10x better.